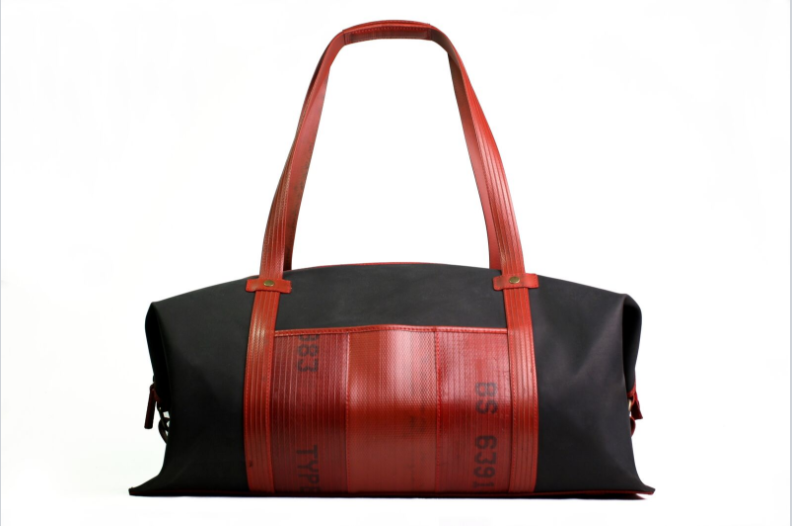 Kresse Wesling updates us on up-cycling used fire hoses and discarded leather for luxury use! Romy catches up with Kresse Wesling. Kresse shares intimate insights on thoughtful expansion and overcoming those times when other’s minimize your work. Great new product line and authentic conversations on social enterprise. Romy: Welcome to another episode of the Bonfires of Social Enterprise. This is Romy, and I am excited to catch back up with Kresse Wesling on this episode! We spoke with Kresse about 18 months ago. 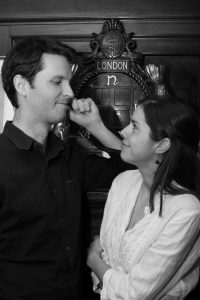 She and her husband, Elvis, have a social enterprise in London called Elvis & Kresse. They upcycle discarded fire hoses and make them into gorgeous bags and belts. In just a little bit, we will hear about some of their new product additions along with some amazing insight on how they keep up their energy for high-level systemic change when faced with barriers and challenges. She even discusses how she handles situations when others minimize her or their business. These guys are true professional social entrepreneurs, and I learned a lot. Now, before we move to the interview, we have a new guest young man for our Fun Fuel. From Traverse City, Michigan, please meet Reece Robertson. Reece, what do you have for us? Reece: Attack, Supply, Forestry, Booster and Suction….these are all names of firehoses designed for specific uses in putting out fires. Until the mid 19th century, most fires were put out by water buckets transported to the scene. Firehoses were created soon after that but they were very basic to say the least. In 1673 in Amsterdam, Jan Van Der Heyden and his son Nickolas took firefighting to the next step with the first firehose made of leather. This improvement made it’s way to the United States by 1794 in Philadelphia. Members of the Philadelphia Humane Hose Company developed the leather hoses to be fastened together by copper rivets and washers instead of sewing them. This cut down on the hoses bursting from pressure at their seams. Modern firehoses use a variety of natural and synthetic fabrics and elastomers. They allow the hoses to be stored wet without rotting and resist effects of exposure to sunlight and chemicals. Modern technology has made the hoses lighter to help reduce the physical strain for firefighters. Romy: Thank you very much, Reece Robertson! Fire Hoses have come a long way! Romy: It's been almost a year-and-a-half since you, and I talked and had our first interview learning about your business. I really want to take this opportunity to catch up. You were one of our most popular guests, as I mentioned, from season one. We want to hear what's happening with your business, everything from what you're having fun with, what your most popular products are, what you guys are doing from a business perspective, just generally what's happening. Let's start wherever you want. Kresse: I suppose that you always have to start with quite a victorious statement like, we're still open. The business is still running. Nothing terrible has happened. I genuinely, I think you can lose sight of these things. Everybody always wants to hear what's the most exciting thing that's going on, but often the most exciting thing is that the mission we started with, rescuing the fire hose, is still the mission that we're on. We're just doing that better and better all the time but very much still engaged with our corporate's [inaudible 00:01:23] and really excited about that. Romy: That's such a good word. I say that all the time. The number one rule of social enterprise is to stay open. That's the number one rule is sustainability. [inaudible 00:01:39] make it more complicated than that. Let's place-hold on that for a second. What do you feel has been some of the reasons why you've been able to stay open? Kresse: I think that certainly, we know that there's a gathering momentum behind purpose-driven businesses. We know that the consumers are becoming increasingly aware of where their money is being spent and what their money is being spent on, and what the potential added value of that cash is and that spend is. We're constantly gaining new audiences that we didn't really know were there, and it's real because more and more people are thinking, "Okay, I need a backpack, but I'm not just going to go and buy whatever backpack is the first one I see. I'm going to do a bit of research on-line. I'm going to look around," in the same way that people used to do this for really expensive purchases like a car. You would go and drive around lots of car lots, and you would talk to lots of people, and you might go on-line and see which is the best fuel efficiency, and which has the best guarantees and ratings. We think that people are taking that level of research down to more everyday products. We've had customers that have said that they've compared reviews for five or six wash bags before buying a wash bag from us. That is something that is a trend that I think is only going to continue. Romy: I do too. I'm noticing people, say here in the US, they're voting with their dollars where they're going to spend, what their activities are, what restaurants they support. That's mostly good, I find mostly good, sometimes not, but mostly it's a good sign that people aren't just blanketly accepting, I guess, marketing, or blanketly accepting. They're finding out for themselves, which makes it have to be good, good quality in addition to our social mission, right? Romy: Last time we talked, you had a belt and a bag, and I think you were experimenting with a couple of different types of bags. Is that still your product line today that you're making from the reclaimed fire hoses? Kresse: Yeah. Our fire hose collection is still constantly improving, but probably the most interesting addition to our collection in the last year has been really the kind of upsurge in our leather reclamation project. The fire hose problem is a niche problem. There are about ten tons a year in the UK, something like that. It's one we very much at our size now can [follow 00:04:38]. When we started to be approached by a couple of the luxury companies with their leather scraps, so this is the off-cut when you cut out the pattern for a car seat for a Bentley or [inaudible 00:04:51] Martin, or you cut out the bag pattern for a luxury handbag, these are the scraps that are left behind. When we started to research that problem, we learned that it's an 800,000-ton-a-year problem annually. This is just absolutely beautiful leather that's just been tanned, just been dyed, and it's on the cutting room floor, and it goes to landfill or incineration. We have for several years been trying to work out what to do with that. About two years ago, so maybe just before I talked to you, we had come up with a system to turn that into three shapes that you can interweave to make a variety of things. 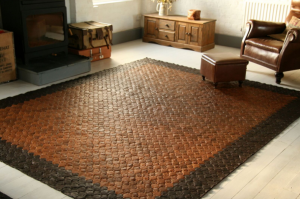 Over the last year-and-a-half, we've just seen a lot of uptake of our leather system, so the first product we made was rugs, and we've started to sell lots and lots of these leather rugs, which are great, because people can order them in any size they want, in any color combination they want, and because it's component-based, it also means that if one little piece somewhere gets damaged, you can just replace that one piece instead of replacing the whole item. It's an incredibly powerful system, and it's getting increasing fan-based, and we're about to launch a whole collection of bags also made in this way. Romy: That's fantastic. Kresse, where was the leather going, the scraps going before this? Where would they go? Would they go into the trash? Kresse: I think that's what we're the best at. Where Elvis and I are at our best is where we find something that just shouldn't be happening, but there's no other solution for it. Most of it goes to the trash; some of it gets shredded to a pulp, and they add a lot of glue to it to make basically a leather equivalent of an MDS, and they call it E-leather. It's basically glued-together bits of leather dust to make a material substitute. The problem with that is, there's a lot of energy that goes into it, there's a lot of chemicals that go into it, and we think there's a better way to retain the value of the leather as is. Yeah, the rugs are definitely a testament to it. We had a huge birthday celebration here over the weekend and had about 30 people line dancing across one of our leather rugs, so we've definitely done several years' worth of product testing now. If it can survive 30 people line dancing on it, then definitely it's going to have a lot of longevity in your home. Romy: Oh my goodness, that's so funny. That's great. You didn't by chance take a video of that, did you? Kresse: I think there are some short videos on Instagram this morning. I'll have to try and send one to you after [crosstalk 00:07:56]. It is quite funny. Romy: We'll put it in our [notes 00:07:58] for this episode. Kresse: I think it's also quite funny to see a bunch of English people line dance because it's not a second nature over here. Romy: That's so great. Let me go back to this place of ... I do recall part of your initial passion with the fire hoses is helping to reclaim some of these things that people discard, like the fire hoses. Kresse, sometimes in a social enterprise when we find a gap, people always say to me, "Why don't you just do this? Why don't you just do this?" As you've, I'm sure, can expertly discuss, it's not just getting, for example, the leather, the fire hoses, it's figuring out a way to store them, and how do you process it, and what do you do with the extra? There are all of these things that go into it. Do you ever foresee a business like yours becoming somewhat of a supplier because you do collect so much, and there might not be some that fit within your products? What happens to the stuff in the middle? Kresse: I think the really interesting thing for us is that effectively we're designers. Elvis and I are product designers, but it doesn't stop with the product. We are very carefully curating and designing the whole way that the business runs, so we're always trying to maximize the utility of all the materials. If it's better to work in partnership with someone, if that means we can reclaim more materials, then that's what we'll do. Kresse: Paid work and training while in prison. It's an amazing thing to do. It can never stop with just the product. We want to have an exemplary business in every possible way. We want to, in a lot of ways I guess, I want to ride into every meeting I go to on a very high horse and say, "Come on guys pull up your socks. There is a better way to do this." We are on that journey, and we're going to keep getting better, but come on, get on a horse and join us, let's do something. If we're not carefully designing every aspect of what we do, then we're failing. If we're not making sure that the materials that we collect have the best possible second life, then we're failing. If the best possible second life comes to us giving the material to someone else, we will give that material away. I often think of a time ... I imagine in the future, a way that actually we can open up our process significantly by opening our doors even wider and letting more and more people in. We generally want to create a more collaborative, helpful movement, that's about rescuing all the resources in the world, not just those that Elvis and I can take. Romy: Yeah, I'm writing down so many notes and trying to figure out what are my top questions for you, because I have about 100 and we don't have that much time. You're just really speaking to my heart of systemic change, not just for resources, but people. You're really speaking to my heart. I'm going to change directions a little bit, because of what you just said. A burning question in my heart is, how do we all stay motivated when you're working to raise the bar so high and be consistent about raising the bar? Here is what I hear a lot of people say, just to set this up a little bit. Okay, Romy, that's fine that you want to set the bar up there, but that's not sustainable to keep it there. We don't have that kind of environment. I just hear a desire to be there, but almost this uncertainty on how to keep the energy up and the strength up to do it that way, when their economies don't have that traditional support, do it differently. This is probably the number one question or comment that we receive. I'd say, Kresse, especially in the last eight months. They say, "Gosh Romy I really want to do it that way. It's the desire of my heart. I don't know how to do that sustainably, or get the other team to buy onto that." Would you be able to comment a little bit on that? Kresse: This is a phenomenal question, and I guess there are several answers to it. I am pretty heavily into the climate change movement, and I've got a lot of colleagues there, that are suffering from what they're calling pre-traumatic stress disorder. We've got scientists that have known for 20 years that we were headed the wrong way. They know it. They know it, and their colleagues know it, and 99.9% of them absolutely know it, and they're telling us to do something different, and people aren't changing. A lot of people in that field are suffering emotionally from this because they have been raising the bar and people aren't awakening to the reality that their presenting. That is really tough when you're engaged in environmental work and social enterprise because you read the newspaper and you see that bad stuff is happening. It's really just difficult. I am not one of these people who is totally unaware of reality and lives in a bubble, where everything is perfect and happy and nice all the time. I get that the realities are fairly stark and actually in the last eight months a lot of has happened. We've had political issues in the UK, and they're happening across Europe and happening in the US. I remember going to one meeting at Oxford University, and somebody said, "Kresse how are you going to react to this new reality and how do you feel about it? Are you going to just sort of throw up your hands?" I said, "Goodness no." Up until about eight months ago, I would never have called myself even a feminist. Well heck, I'm a feminist now, if I wasn't one before. It's even more important to be passionate now. It's even more important to stick to your guns now and to be principled. It's more important now to tell like it is and say, "You know what? There are good industries, and there are bad industries. There are exploitive industries, and there are nonexploitive industries. There are companies that are treating their workers unfairly, and there are companies that treat their workers brilliantly." One of the big things that keep me going is that we've had ... We became one of the founding UK B-Corps, yeah just basically a year ago, no a year and a half ago, that's when I think when it really started to take off in the UK. That community of companies in the UK is growing and growing and growing. I think we started with 30 of us and there's 100s now. It's the coolest thing you can be as a company. People want to work for B-Corps, and the B-Corps want to trade together and work together. I think there is a band of merry men here and we are all going to push the boundary just a little bit further. We want to prove that this is where the future is. What I like about it is that it's using the language of business that is familiar to everyone. You can't pretend that we don't understand. I went to one meeting where someone intimated, the CEO of a very famous, traditional, luxury company intimated that, that I don't exist in the real world, that my company doesn't exist in the real world. I just said, "10 years worth of profits. Ten years worth of turning fire hoses into handbags and I don't exist in the real world?" Kresse: We all exist in the real world. As far as I know no one from that meeting was from Mars or Venus or the sun. I have a balance sheet and profit and loss sheet and a trading history with her Majesty's customs service to prove it. I think we have to become very clear now, about seeking goodness and delivering on goodness and very clear about what marketing means. For me, marketing is the truth of what we do. That's all it will ever be. There will never be an Elvis and Kresse campaign that is divorced from what we do. We have to be very ... Now, more than ever we have to be very clear about what our objectives are, and we have to stay with that mission, and we just have to keep pushing and almost double down on the good aspects of what we do. Romy: Yeah. We have a saying here that we decided to start to put on some of our materials last year, late last year and that speaks the truth in love and always demonstrate the impact of that and declare life. Speak life over people and encourage people and things, because the truth is good and it's okay to proclaim your truth. I am in such agreement that, now more than ever we got to be the opposite of fake it till you make it. It doesn't hold water anymore. There are a beautiful courage and authenticity with those of us that are in the field or on the street, or whatever you might say. There's such rich learning about collaboration and people coming together to different religions, cultures, locations, ages, backgrounds. There's such rich learning when we mix our tribes if you will and not in a forced way. In a way where people are courageously taking a step of discovery and reporting that truth out is magnificent. Just magnificent. It's part of obviously why we do this podcast, to kind of help elevate those who are doing this magnificent stuff on the street. Romy: Yeah it's really incredible. I'm glad you brought up that conversation. I know so many find themselves in that conversation and call those that conversation of dismissal or denial. Romy: ... beyond thousands time we've heard that said to us or another. Oh my goodness, it's almost ridiculous. That's actually becoming more of enormous, people saying things like that. Then the shock and awe of the reality when they really are going well, and making changes, and making a huge impact. Mostly with people, I'm watching most of the impact happen to people's hearts, no matter what the product, what the valued impact. Could you speak to that a little bit about how you watched ... Is there any effect that you see with people that come along side? Kresse: Along side with you? Actually, I had a really interesting chat this morning with someone with the British Dental Association, and they were talking about actually how difficult it is for dentists to stay innovative, because it's a very stressful job, and to stay involved in the most purest form about why they decided to become a dentist. The conversation came to a head when we were talking about, "Well, how do you define success?" For some people, it's the size of their dental practice. Excuse me. I said, "Well, actually maybe if you said, 'Well, what if we redefine success for dentistry as what is the oral health of my community?'" Then it completely changes how you approach your practice. It completely changes how you define what you're doing and what you do on a day to day basis. That's the big thing, because a lot of people who are unhappy, often it's because the benchmarks they've set for themselves don't actually fit with anything that brings them joy or happiness in life or their profession. People don't think they're allowed to redraw that boundary. I think that more than ever is what people have to start to do. Say, "Well really, why do I have to accept that this is the norm for my industry, or that this is the norm for my life." You know, there's a doctor that I know really well in the UK, he's a GP, and he's got the most unconventional GP practice that you can imagine. It's got 100 or so businesses operating out of it. Nutritionists, gardeners, community workers, and he just said, "Look, you know, a GP practice should be at the core of the community. It should be at the center of things, and the only way to make it at the center of the things is to have a piano teacher teaching piano lessons in the waiting room. If that improves the community spirit here and community health, then how can you argue that what I'm doing is bad?" He's had the hardest and cynical journalists visit him, and they all turn away converts, because they leave going, "Well, no, it's not what you're used to from a GP practice, but it's a lot more interesting, and it makes you want to go back, and it makes you want to be involved, and it brings you closer to your community, and probably closer to some emotional, mental health." So, we just have to think of boundaries differently, and definitions differently. I don't accept anyone's definition for me of what an entrepreneur should be, or of what a good business is, or what a successful business is. When people think it's about money, I just think that's such a ... That's one single lens to view the world with, and it's a fairly limited one. Romy: Yeah, it kind of makes you feel isolated and focused on self. I love that. Wow, I love that story. Then you layer in ... I mean it's a little bit hard to measure all the impact because you could go on and on, but there are just some obvious ones that you don't have to fill in. I mean, you can't measure joy. Somebody listening to the piano in there that brings me joy if I hear a joyous noise. I don't know how you measure some of those things, and I think that brings me to another point. I think we almost have to release ourselves from measuring everything. That's one of the songs I'm singing. Even though we're a reporting firm and we have to measure something, I feel like part B of almost every conversation I'm having lately is, "Well, let's release us from measuring everything, because it's not possible, it's just sort of arrogant. Kresse: Yeah, and also we've got a couple of quantifiable measures here. We have those, and they are great. They're great for us to keep us on some kind of a track, but actually the things that are the most powerful for us are always the stories, always the anecdotes, always the customers that call us after they've had a bag for seven years, and just tell us how they're still enjoying the bag. You think, "Gosh, that's incredible." Or people who, we occasionally still get hand written letters from people thanking us for some last minute personalization or detail that we did. You can't stack up all the letters and say, "Well this year we got this many, and these really, really made us feel good, and these only sort of made us feel good." You absolutely can't measure everything. Sometimes you do have to go on instinct. If you go ... I had this conversation recently in Exeter with a group of MBA students there, and they said, "How do you make some of those decisions? When you decided to give half the profits away, how did you make that decision?" I said, "Well, you learn some pretty valuable skills in kindergarten, and then you spend the rest of your life trying to pretend that sharing isn't kind of the best way to go?" It's really bizarre, we're all taught as children to share, and then suddenly we're taught to be selfish. Sharing is the best possible thing that you can do regarding your own well being and other's well being, and peoples sense of collaboration and community. When has sharing ever made anyone feel bad? That's basically traditional business is specifically structured to be competitive and selfish and judge people and rank people and pay them according to this, that, or the other restriction, and it's just so weird. Our approach to immigration, in Europe we're having a lot of debates about immigration, and I find that weird, because basically everywhere on Earth, the whole story of human civilization is a story of migration. Kresse: The most beautiful, powerful, amazing things happen when you get, as you were saying earlier, you get different people coming together to create new and unique experiences. Like this morning, when you get me talking to dentists, and you realize we've got all sort of things in common, and that's where innovation comes from, talking to people from different industries and different cultures, and different backgrounds. So the idea to me of trying to say now, "No, we don't want anymore of this. This precious thing of new ideas coming in and out, we don't want anymore of that." I find that very bizarre and unlike kindergarten in every possible way. If it wouldn't fit in a kindergarten class, I don't want it in my life. Romy: That's a good, simple way to quantify and use a filter. I love that. Romy: Also, you can rest there too, right? I remember taking a nap on my little towel. Romy: Kindergarten you have to take a nap, lay down, rest for a minute. We can get work and stars, that's so great. Kresse: Yeah, and it's like sharing, and don't hit someone, and there are better ways to resolve your issues, all those, and basic math. Just basic math, rather than all these absolutely impossible equations we've invented for a society that allows financial systems to run amuck. If we actually went to basic two plus two does equal four, and can't be split up in a thousand different ways to equal 17, it would be better for all of us. Romy: Yes, for sure. Well, Kresse, do you mind, just to catch us up from last time, have you noticed anymore of this ... Since we're on numbers measuring them or not, you had already made a huge change in your community rescuing the fire hoses. Since that was your first endeavor, if you will, your rescue endeavor, a year and a half sometimes make a difference. You had had some extraordinary numbers at the time, and the community had had relief there, and have you noticed anything more since then that's a revelation in any way of what you'd do differently, or what you'd keep doing? Kresse: I think we have become in a certain way ... We have two things that we're doing simultaneously. In one respect we're becoming more focused. We've really learned to accept there are things we're specifically good at, and we need to stay focused on those. So the rescue of materials transformation into very high-quality goods. That's our real sweet spot. Although there are a lot of other things that we can do, that seems to be where we can have the biggest impact. We've really zoned in and focused on that, and that's led to us actually hiring some more people to help us in those areas, and to help liberate me from doing a lot of things that I'm not necessarily the best at. I'm not the best at developing online communication tools and things like that, so instead of trying to spread ourselves thinner, what we are trying to do becomes much, much more focused on what we do. In doing that, we're able to take on more materials. Just our expansion into leather reclamation has kind of increased by a factor of 10 since we last spoke. Actually, we're thinking of ways about how we could attack really the 800,000 ton a year global problem, which would make me a company 80,000 times larger than I was a year and a half ago. Kresse: So we have to work out a way to either grow to that size or collaborate to achieve that same objective, and I have a feeling it's gonna be the latter. But it's interesting through focusing more on what we're best at; it's actually allowing us to bring in more people, engage with more people, engage with more materials, and spread our mission much, much wider. Romy: Love it. There's such a truth there. Love, love, love that. Then part of that too is, how do you decide what things you engage in for the community, for ... I mean, there's so many things. I don't know about you, but we're asked to do so much about, "Hey, will you sit on this committee for this particular community thing, or association, or even all the media?" Right now, I'm the media in your world with this podcast, but there are so many things of trying to figure out what speaking opportunities do you take, what type of engagement? How do you determine and draw boundaries there too? I find a lot of that's instinct, but sometimes you have to set a boundary, and I've found that to be very difficult. How do you address that? Kresse: Well, I'll give you one key example. We get an email probably five times a week from a student somewhere in the world that's doing a paper research on social enterprise, ethical fashion, something related to our business model. I can't spend four hours a week answering each one of those sets of questions. So what we did there was actually I made a worksheet, and I answered all the regular questions that I get asked, and now I just send that same, it's a four or five page very well thought through the list of answers, and it tends to help everyone else. Instead of denying those requests, we've found a way to deliver the information to people when they need it, but without maybe having the same personal nuance every time. In general, I used to say yes to everything; now I can't. That is very frustrating, but it's just the reality of us sticking to our core mission. There are still sometimes when I really hesitate back and forth, should I do this, should I not do this? I always just have a little chat with Elvis, and he'll say, "How is this helping with the hose? How is this helping with the leather?" If I can't make a case for it instantly, then it's gotta be something that we forgo. It's tough to say no to things, especially when everything about your business, and everything about your self and your own personality ... I just want to be generous, I want to be everywhere, I want to be doing everything, but that means that nothing happens. So yeah, we've just learned to say, "If it's not progressing the core mission, we can't do it." If there's a way for us to game our way around it, then we'll do that. We are lucky that there's now sort of a back log of YouTube videos, and interviews, and loads of other resources that we can send and share with students and potential collaborators. But yeah in general, it's tough to say no to things, but you have to learn to. Otherwise, life becomes impossible and your core mission then gets neglected. Romy: Thanks for speaking into that. I'm the worst offender of it. That's why some of my partners ... One of my sisters is one my partners thank God, because I'll say yes to everything, and she's like, "Oh, hey hold on." Or I'll give away things; I'm just, I really have to practice every day every hour of staying in my own boundaries so that we can continue to deliver what we're doing. Thank you for speaking expertise into that. Well, is there anything else you'd like to share with the listening audience around the globe about your work, or anything that's on your heart? Kresse: Yeah, sure. I think the most interesting ... We are in very, very, very interesting times, and I guess the one thing I really want to leave with people is that the best thing that you can do with your time is where you can do the most good. That should be your overriding, overarching thought. If you're ever frustrated, or if you ever find things are too difficult, you've got to realize there are whole heaps and loads of compromises associated with that, but you do have to focus on where you can do the most good. Particularly now, when we need more good to be done so that it shines through against a backdrop of not a lot of great. Romy: Yeah. Oh, what a good word. Thank you, thank you, thank you, Kresse, so much for speaking life over everything this morning and giving us a peek on the inside. Let's just re go over your social media and the places they can reach you and look at your products. Kresse: Sure. 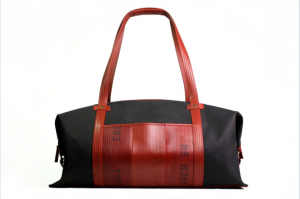 Our website is www.elvisandkresse.com, so Elvis like the singer, A-N-D-K-R-E-S-S-E dot com, and it's the same for Facebook, and Instagram, and Twitter. Romy: Okay. 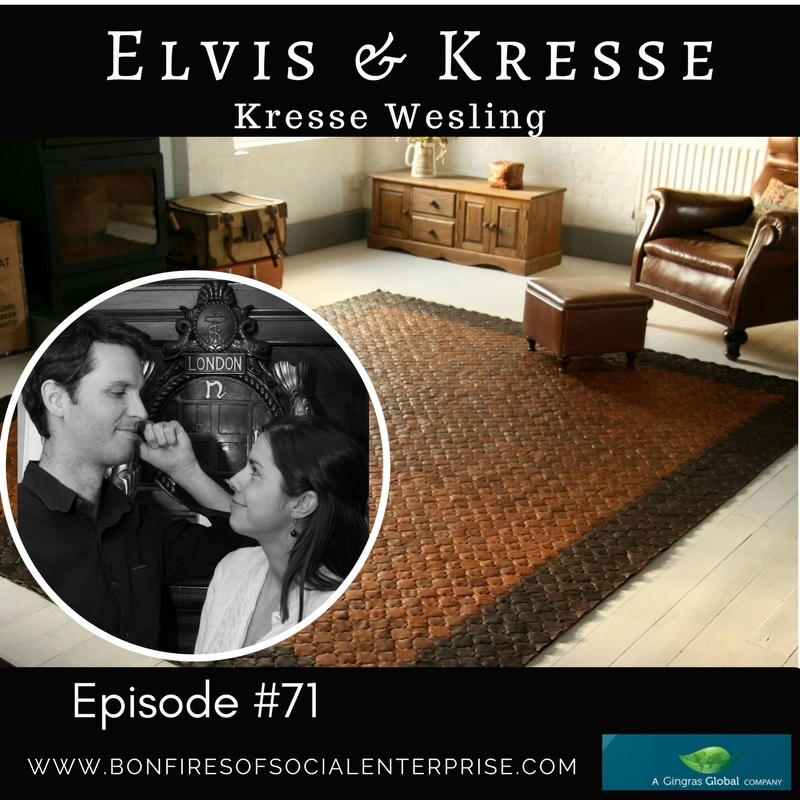 Thank you, Kresse, I appreciate, tell Elvis we said, "Hi," and we look forward to more conversations and keeping this little mini audio documentary going. Kresse: Thanks a lot. I really appreciate it. Romy: Whew, that was chocked-full of goodies for everyone! Big thanks to Kresse for spending a good hour with me out of her day so that she could share with all of you. Please check out their site and support them however in you can. Time to close out with another great song provided by our friends at Assemble Sound in Detroit. Here is Astray and his song Shallow Waters.